Greek Tombs - this train is bound for glory. Really! In the image on the right, the National Archaeological Museum of Naples is the large building at the very bottom (lower left); the Capodimonte Museum is the large building at the top. (North is at the top; thus, we can call the Capodimonte museum 12 o'clock and the National Museum 6 o'clock.) It is 1400 meters (not even one mile), as the crow flies, from one to the other. The two large streets that form the obvious 'V' are via S.Maria Teresa degli Scalzi running up from 6 to 12 and via Foria running from 6 o'clock over towards 2 o'clock. If you are standing down at 6 and looking up at 12, you are at about 40 meters above sea level; the Capodimonte hill is at 153 meters, so it's a steady climb if you want to walk it. Capodimonte is one of the hills that form a semicircle around the general area. The others are all off the left-hand side of our clock-face: San Martino-247 m; San Potito-80 m; Materdei-142 m. They are the most important ones for our story because for thousands of years their slopes have been very effective at channeling torrential rain down into the general area. That general area you see here within the 'V' is called the Sanità. It starts at the foot of some hills out of the picture on the left and, as you pan past the museum to the right, changes neighborhood names to Vergini and Miracoli. The rains I speak of were collectively called the “lava dei Vergini” (yes, that is a masculine plural of 'virgin', by the way. The interesting story behind that is here.) The rains swept through lower elevations, and in many places washed away the top soil, laying bare the underlying volcanic rock known as tuff, the most prevalent building material in Naples. (Those rains were also responsible for one of the most bizarre episodes in the history of Naples, the founding of the Fontanelle cemetery. See this link.) So the Greeks built their city farther back (south) towards the coast (it is 1800 meters straight down from the Archaeological Museum (6 o'clock) to the main Royal Palace at water's edge), and they put the north wall right where you are standing at that museum. The wall ran due east (to the right);you can still see where the ancient wall turned in to the south (where the bottom-most yellow pin-drop is). (A more detailed view of the wall is here.) Everything north of the wall—in the 'V'— was hallowed ground, the “Valley of Death,” where for centuries the Greeks interred their dead in hypogea (undergound chambers: the singular is hypogeum). The Romans did the same thing, sometimes even reusing the old Greek hypogea, but also building new ones. Finally, the early Christians came along and left many catacombs (largely forgotten after c. 800 AD). Most of the Greek tombs go back to the 4th century BC up to the middle of the 3rd century BC. They were all found by chance in the course of building various structures over the years (as recently as the mid-20th century, when tunnel construction for trains and cars found a number of them). Many of them had been looted or destroyed during the centuries, and a few were dutifully noted and then plowed under by modern engineering. They were usually at depths of 10 to 20 meters; in the best-preserved ones, you can find frescoes, funeral urns, couches, vestibules, stairs, etc., everything you need for comfort in the afterlife. 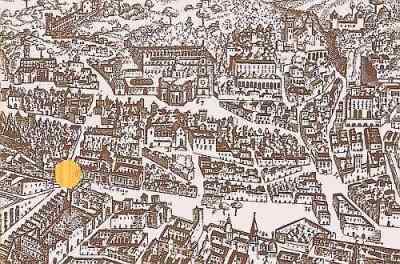 The area sprinkled with yellow pin-drops in the image above is obviously one of great archaeological interest. If only someone besides archaeologists could actually get in and see these underground remnants of ancient Greek Naples. You can! There is at least one organization dedicated to promoting at least some of them as education tourist sites. The group is called the Celanapoli Association (the word 'Celanapoli' is a portmanteau invention meaning 'hidden Naples'). They have been in existence since 1992 and the going is slow, as one might expect in the cases of places hidden well below the surface and even below the foundations of buildings, places covered by thousands of years of history. The site they are working on at the moment would have gone totally unnoticed had it not been for the earthquake of November 1980, in the aftermath of which it was necessary to do down in that area and perform safety checks on the foundations of buildings. They revealed the presence of these underground spaces, and since that time, the Celanapoli Cultural Association, coordinating its efforts with the Special Superintendent for Archaeological Heritage of Naples and Pompei, has been promoting the restoration, appraisal and further disposition of these remarkable bits of subterranean heritage. The site is marked by the left-most yellow pin in the image (above). They call it the Tomb of the Togati (but there is such a word, if you insist, as "togaed"--I'm holding out for 'betogaed'). In other words, this was the final resting place of an aristocratic family or familes, those who wore togas. You can get in and take the tour. They even have a website (in Italian) at this link with further contact information. Other underground structures in the zone (and elsewhere in Naples) are the many quarries where tuff was extracted for general building material. Some of these can be accessed from the surface. The general estimate of the number of spaces (tombs or quarries) beneath the area in the top image is about 150; perhaps 75 have been located. Development of the area came quickly. If you look at the 1566 Laffréry map (below, left), you clearly see the northwest corner of the city, the wall and, on the other side—farmland. Oh, the Greek and Roman tombs are down below the surface all right (and had been for 2000 years! ); so are the Christian catacombs, but no one knew. One century later, look at the 1670 Baratta map (below, right). (The yellow dot is the same corner, outside the archaeological museum. The same large empty space is in both views; that is today's Piazza Cavour.) The catacombs had been rediscovered, people flooded out of the city and filled it up with churches, monasteries and homes—all this in an area that the Romans had once declared “pomerium”, beyond the walls, sacred and free from construction forever. "The Line between the Two Museums." There is —at least there was going to be— another development, referred to in the title of this entry. (Sorry, it had to be set up at some length!) In 2001, the Centro Speleologico Meridionale (Southern Center for Speleology) released a preliminary report on the feasibility of connecting the two museums via an underground fixed rail line (either cable car or rack railway) that would essentially be a tourist trolley through some of the ancient tombs and quarries of the past. It would be called "The Line Between the Two Museums." You would be able to make a few stops along your way through history, see a few tombs (such as the one in the image on the right) and wander around in one or two of the huge quarries (such as the one shown below) fixed up, of course, with modern conveniences...coffee bar, book shops, a place to ditch the kids. To that end they undertook a study, first, of trying to locate tombs and quarries in the area, and second, of trying to determine their condition. are just above the bottom row of eight. The report enumerated dozens of underground spaces in the area of interest, a few of which are marked by the yellow pin-drops in the image at the top. (The lower eight are all Greek tombs. The very bottom one is right at the wall, so historians think it is probably the oldest. The large Christian catacombs are not marked and are higher up; the well-known catacomb of San Gennaro is just below Capodimonte on the left of the main road.) The general idea was to move up the right-hand side of the 'V' and come up from the southeast to the Capodimonte Museum and then move past it and on to the Colli Aminei metro station (off the left side of the image, now finished but still under construction at the time of the study.) The researchers took scores of photos and got Catalonian architect Oriol Bohigas to handle the design.There was no mention in the preliminary study that I saw of the number of stops the train was going to make. I'll guess three or four. I am indebted to Fulvio Salvi of Napoli Underground (NUg) for granting me access to the study from which I have drawn this information. An English translation of the study is on the NUg website at this link. The bottom two photos on this page are from NUg.